On Saturday, September 17, 2016 from 4 p.m. – close, Oktoberfest will fill the open air beer garden at Brat Haus in Scottsdale with an abundance of traditional food and festivities. This year, the Brat Haus Oktoberfest will be an affair for those 21 and older with themed activities, food, craft beer and entertainment. Oktoberfest activities highlights include beer garden games, brat eating, lederhosen and dirndl, stein holding, and beard contests. This year we’re starting Oktoberfest later in the day and making it a 21 and over event. We’ll feature more grown up games and traditional Bavarian festivities,” said Dave Andrea, owner, Brat Haus. 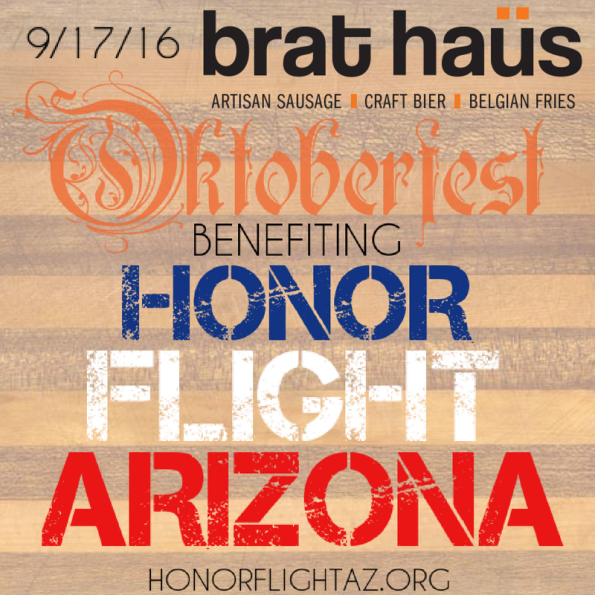 Benefiting Honor Flight of Arizona, no Oktoberfest would be complete without a feast and that’s just what you’ll get at Brat Haus. Sink your teeth into knockwurst, schnitzel, brats, giant turkey legs, pork knuckle and specialty pretzels created just for this event. Presale admission is $8 if purchased online or in advance at Brat Haus. Or, for $15 Brat Haus will sell commemorative t-shirts that include admission. Day of entry is $10 at the door and free to anyone who attends Oktoberfest decked out in their lederhosen or dirndl. Visit www.brathausaz.com to purchase tickets online. Honor Flight Network is a non-profit organization created to honor America’s veterans. Donations to the organization help transport veterans to Washington, D.C. to visit memorials that recognize the sacrifices and accomplishments of soldiers who fought during WWII, The Korean War and The Vietnam War. For more information, visit: www.honorflight.org. Nestled in the heart of Old Town Scottsdale, Brat Haus features Arizona’s most welcoming beer garden with 28 craft beers on tap. The menu features made from scratch cuisine inspired by European food craftsmen, offering a wide variety of brats, burgers, salads and sides. The open air patio paired with delicious grub and genuine hospitality from friendly servers, makes Brat Haus the perfect Scottsdale spot for a casual lunch or dinner. Elevate your merriment by enjoying one of the patio games including bag toss, ping pong, darts and life-sized Jenga. The patio is also a dog friendly zone – so be sure to bring Fido along for the fun. Brat Haus is located at 3622 N. Scottsdale Road, Scottsdale, AZ 85251 and is open on Sunday-Thursday, 11 a.m. – 10 p.m. and Friday-Saturday, 11 a.m. – 11 p.m.
Visit Brat Haus online at www.brathausaz.com to view upcoming events and for the full in house and catering menus.